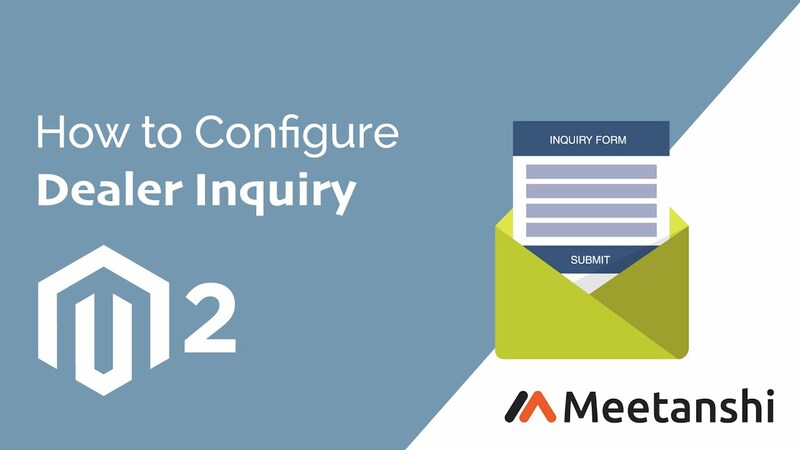 Magento 2 Dealer Inquiry enables a custom form for dealer's inquiries, list inquiry details in the backend and allows admin to create new customer accounts for them. Custom page to add form fields as required. Easily manage dealer inquiries via a separate backend grid. Google reCAPTHCA integration in the custom form. Generally, online distributors have to go through a tedious and manual process of dealership inquiries, analysis, approval and creating dealership accounts. To ease the task for Magento 2 distributors, Meetanshi has developed Magento 2 Dealer Inquiry extension that enables a custom form to collect dealer inquiries, lists inquiries in the backend and allows admin to create customer accounts for dealers. Magento 2 Dealer Inquiry extension notifies admin for new dealer inquiries and acknowledges dealers for successful inquiry submissions. The grid in the admin panel is updated with the details of the inquiry. Admin can check the details and create a new customer account when he approves the dealer. On create account event, an Email is sent to the dealers having account registration details. With custom form fields, admin can acquire all the details needed to create and approve a dealer account! The customers find it easy to register for dealer account using this process. Hence the Magneto 2 Dealer Enquiry module is beneficial for admin as well as customers! Easily accept and manage dealer inquiries. Create a separate page for form inquiry fields and set preferable URL for it. You can also set the meta title and description for the page to make it SEO friendly. Option to show dealer inquiry page URL either in the top link or in the footer. Automatically add new customer accounts created for dealers into the specified customer group. You can set custom form title, description, submit button label and success message. Select to show only required form fields in the page. Validate dealers to upload specified file types while submitting dealer inquiries. Easily customize labels of the form from the backend. Admin gets an Email immediately after a new dealer inquiry is submitted having inquiry details. Integration of Google reCAPTHCA in the custom form to avoid spam inquiries. A separate grid in the backend to manage dealer inquiries. Option for the admin to add new dealer inquiry from the backend. Admin can edit, update, save a dealer inquiry using an individual action. Also, admin can delete an individual dealer or create a customer for the dealer from the "Edit Inquiry" action. Mass action to select and delete multiple dealer inquiries together. the grid makes it easy to check the inquiries! Easy for customers to make dealer inquiries. 1.0.1 Compatible with Magento 2.3.